We are absolutely delighted to be able to bring you the two amazing men in our life – Garth, Helen’s Husband and Tim, Leonie’s Husband. 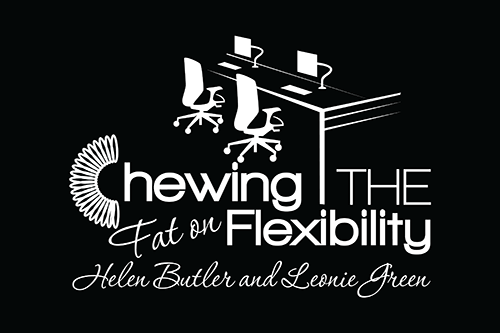 We thought it would be great for you to hear about their experiences of flexibility, as you would have gathered from the journey so far, we love our blokes, maybe have given them a swot (in Helen’s case) or two, or (in Leonie’s case) we’ve heard how amazing her life is (dymo labelled tupperware in her pantry etc etc). What did we get out of this – our blokes are fabulous, but have an interesting take on flexibility, their personal and professional experiences. Both our families didn’t keep up with man as the main breadwinner constantly, we flip flopped, took breaks, took turns, consulted and had a right royal time lolling through work and life and family. We were delighted to be introduced by the delectably gorgeous Eleanor Green who made a special guest appearance, twice …..
Over vino and thai, we chew the fat, literally, on how different couples journey through the tumultuous world of family, work, relationships and maintain some level of sanity. We hope you enjoy and say Thank You to our adorable blokes, who give so much to us and love us, faults and all. Enough gushing now, press play! Want to attract more women to your workforce? Read this …….